On Sunday I had the pleasure of going to brunch with two of my favorite bloggers - Kate of Nautical by Nature and Annemarie of Brunch at Saks. These lovely ladies and I met up at Los Angeles hotspot, Toast Bakery Cafe, for good food and company. If the name sounds familiar, that may be because the cast of The Hills filmed at Toast, I believe, a few times. Aside from that claim to fame, the quaint eatery is located on a prime corner of Melrose Avenue and boasts an sizable outside eating area (a must for dining in LA) which draws in crowds. But don't be discouraged by the lines, they go by really quickly! 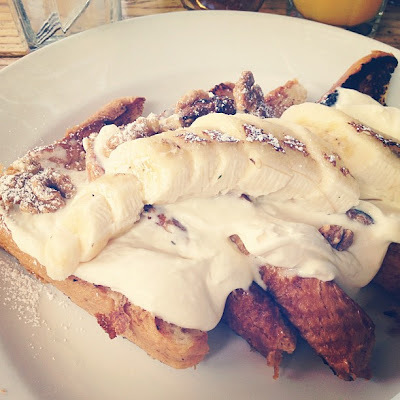 In addition to a glass of orange juice and my cup of coffee I ordered the most delicious breakfast I've had in quite some time, the Stuffed French Toast which comes smothered with caramelized bananas, banana pudding, powdered sugar, and walnuts. For me to say I loved this dish really means something because I do not like french toast or walnuts. I just felt that I needed to order a sweet treat for breakfast since Toast is a bakery cafe. So glad I did. 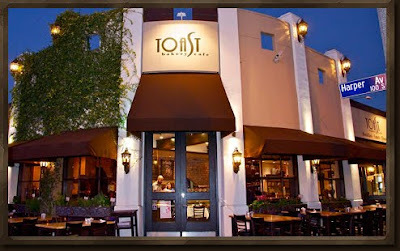 If you ever find yourself on Melrose Avenue, I highly suggest you stop by Toast for a meal! Yum!!! That sound so delish. What a cute little place. That looks insanely good. Have fun on your break! Whoa! That's a breakfst! I want to eat there! Sounds like a blasty blast! If I liked bananas then that french toast would look amazing, but I don't. Lol. I got coconut cream stuffed french toast this weekend in Annapolis. It was SO amazing! That looks fantastic. We have a Toast breakfast spot here in Chicago too. Not nearly as large though. 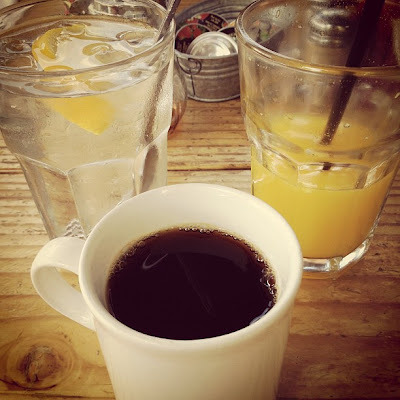 I just love going out for brunch! oh my how yummy!! now i need to make a brunch day with you and go to that place, pretty please?? happy to take over your blog tomorrow! enjoy your few days. I am totally drooling over that picture--just as I was when I first saw it on instagram. Amazing that you ordered it despite not liking French toast (um, how can you not like French toast?! ), but sounds like it was a delightful surprise. YUM! I'm still thinking about those chocolate chip pancakes. YUM! Dude that place looks amazing! Yummy! This sounds SO yummy! And it looks like such a fun place. Oh my...that looks and sounds so very yummy! I'm planning on heading to LA in a few weeks and might have to put that place on the list! And hopefully I will get to see you too!